Are you an athlete looking to drop some "dead weight" and improve your sport performance? Or are you someone who wants a hard, toned athletic body like your favorite sports heroes? Either way, Athletic Training for Fat Loss is for you! As a university Strength Coach, I have seen first-hand what happens to an athlete who gets leaner - everything improves! Speed, vertical jump, agility and endurance are all enhanced - if you do it properly. In addition to these benefits, you also reduce your risk of injury. With a lighter body, you have reduced impact with every landing and foot strike. This greatly reduces the wear and tear that sports place on your body. I also wrote this book for the everyday person who wants that athletic look. You are not interested in the skinny-fat look of many runners, nor the bulky steroid-induced look of a bodybuilder. Rather, you want lean, toned athletic muscle. You also like the idea of knowing that your body is ready to jump into a pick-up game of your favorite sport, do outdoor recreational activities or be ready for a real-life emergency. Plateau breakthrough – by continually getting stronger and progressing to more advanced training programs when needed, you will avoid the dreaded plateaus that often leave people stuck far from their goals. You get hard, toned muscle: contrary to popular belief, light-weight, high-rep resistance training does not build tone. If you want a hard body, you’ve got to move some heavy weight! Hormonal manipulation: this training seeks not only to burn calories, but to naturally alter your hormones to build lean muscle and burn fat. Fun & Variety: unless you enjoy endless hours of mind-numbing treadmill sessions, you will find this type of training as fun as hard training can be. Why cardio rarely gets a person to their fat loss goal. Why jogging will not get you the body you want. How to train in a way that revs up your metabolism and leaves you burning extra fat and calories long after your training session is over! How the right kind of weight training can be the most power exercise tool for fat loss. How to cycle carbs to prevent fat loss plateaus. Which supplements might help your training for fat loss and which are a waste of time and money in the long run. In part 3 of this book, you will learn a simple, effective way to assess and monitor your body composition. You will also receive simple tips and guidelines to maximize sleep quality, minimize stress and live a lifestyle that supports and accelerates your fat loss. Part 4 will give you detailed training programs that will show you exactly what to do in the gym and on the track to melt fat off your body. One of the unique features in this section is that instead of exercise pictures, each exercise in the ebook version is hyperlinked to a video of that exercise where I will show you and teach you exactly how to do the movement. You may have heard the saying, "a picture is worth a thousand words." However, as one wise person pointed out, "a video is worth a thousand pictures." Note: this who get the print version can search for any of the exercises on my YouTube channel. In addition to your goals, another huge thing that should be dictating your training program is the level that you are at. What works best for the beginning trainee will not work for the advanced trainee. There are different “rules” at different stages of the training journey and this book will show you how to train most appropriately at each phase. It has been said that anything works for beginners. What then should be the focus of beginner training? The answer is to get great results while setting yourself up for more effective training at the intermediate and advanced levels. Also, while more and more people have realized that resistance training is very effective for fat loss, this is only true under two conditions: 1) you are skilled enough to do the great exercises properly and 2) you are strong enough that you can do great exercises with a respectable weight. The tiny pink dumbbells will not cut it! The beginner programs are set-up in 3 progressive phases. The first teaches your body how to move well and learn proper technique. The second and third phases are set-up to take advantage of your new and improved technique to rapidly build strength while using energy system work to begin the fat-stripping process. Another unique feature with the beginner and intermediate programs is that they have a short “practice time” section at the beginning. This allows you to learn new movements while you are fresh and then be ready to train hard on these movements in later phases. In the beginner section, you will also learn when it is time to move on to the intermediate training programs. At this point you will have lost some fat and gotten considerably stronger. Now that you have laid this solid foundation of quality movement and strength, it is time to move into metabolic resistance training. The intermediate programs contain 4 progressive phases that use your previously gained strength to rev your metabolism into overdrive. Also, phase 3 will take a break from the metabolic work to boost your strength levels and make the return to metabolic training in phase 4 even more effective! After you have finished the intermediate programs, you can move on to the advanced programs. Another unique feature of this book is that at this level fat loss is approached from several, unique strategies to overcome the frustrating training plateaus that often plague the advanced trainee. Even the best fat loss methods will fail to deliver results after a while. Therefore, this section will allow you to select a different athletic fat loss strategy whenever needed. This section also includes an explosive power program which is a perfect follow-up to the fat-loss programs to get athletes ready for their next sports season. In addition to this, there is a short, in-season training program that is perfect for the competitive athlete or the non-athlete to use during busy times of life. 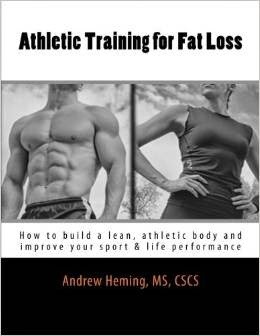 Click on the "Buy Now" button below to purchase your copy of Athletic Training for Fat Loss. You will be able to instantly download the PDF file and equip yourself with the tools you need to burn fat and improve your sport & life performance! As a bonus, you can recieve 25% off your purchase price by sharing this book with your social media!